Four versions of Now Is The Hour appear in the Top 12 Most Popular Songs – Gracie Fields, Margaret Whiting, Eddy Howard and this, the most popular version, by Bing Crosby. It was originally from 1913 when it was published as “Swiss Cradle Song” and the sheet music sold quite well. Two years later Māori lyrics were added (the Māori were the native Polynesians of New Zealand) and it was renamed Po Atarau. An English intro was tacked on a few years later which was the source of the eventual common title “This Is The Hour”, though it wasn’t officially called that, but rather “Haere Ra Waltz Song” (catchy, isn’t it?). In 1945 Gracie Fields heard it while in New Zealand and decided to record it. Her manager changed the first line – and hence the new title “Now Is The Hour” – and three years later the song took off. Not surprisingly the true twisted story behind it was glossed over and it was rather patronizingly called a “traditional” Māori folk song, which it wasn’t. In the 1940’s there was always a great need for material for pop artists as few singers wrote their own songs and professional tunesmiths were not merely working for one artist or label, especially since cover versions of hits were so ubiquitous. As a result those in the industry were always looking for something different and if it could have a creative backstory to stir interest, even if the facts were largely whitewashed, all the better. Rock ‘n’ roll of course changed this as its performers needed songs that fit their own stylistic needs which weren’t to be found in decades old New Zealand songs, native or not, nor were they being written by those in Tin Pan Alley. But in 1948 rock had yet to cross over and so mainstream tastes were delighted to hear something like Now Is The Hour unaware at the time that traditional pop music’s hours were growing fewer in number. 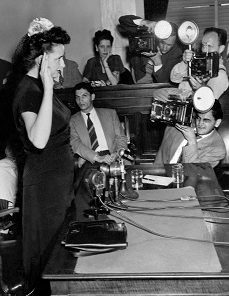 Headlines around the country report on the sensational secret Grand Jury hearings featuring The Red Spy Queen, Elizabeth Bentley, an American covert agent for The Soviet Union from 1938-1945. A well educated (Columbia University) anti-fascist who’d become increasingly political while studying in Italy she joined the Communist Party in 1935 and became a spy as well as a lover to her “controller”, Jacob Golos, a high ranking Soviet spy himself. When he began being watched more closely by American intelligence in 1940 he transferred his duties to Bentley who took over the United States Service And Shipping Corporation, a front for the Communist International Organization which ran the espionage activities. After Golos’s death from a heart attack in 1943 Bentley continued spying but refused to report directly to Soviet agents and began drinking heavily. When those around her in the American Communist Party acquiesced to the Soviets demands she turned against them and fearing for her life, now drunk all the time and losing the support of those she “trusted” (how do you trust other spies to begin with? ), she went to the FBI in 1945 and eventually decided to defect from the Communist Party and become an informer. The top secret news of her identity and defection became known in Moscow because the United States informed Britain’s MI6 (the James Bond folks) which was being run by… a Soviet Double Agent (you really need a scorecard to tell who’s on what team in this spy game). The Soviets did shut down the spy ring for fear of having it unravel with the FBI now assigning 250 agents to investigate her leads. Frustrated by the Soviets pullback on their spies in response to her defection, which was preventing the U.S. from using her as a double agent or to gather information on others involved in spying, FBI Director J. Edgar Hoover authorized the Grand Jury hearings in an attempt to ruin the careers of those implicated in the public scandal to follow. Details of her testimony were leaked to the press and in July she gave a public interview which led to the House Un-American Activities Committee (HUAC) opening public hearings that summer. Though it resulted in no prosecutions it did expose the extent of Soviet infiltration into American government (something still ongoing today obviously) and opened the door for McCarthyism, a self-serving overreaction for political reasons that was less concerned with actual spies than getting headlines for exposing Communist sympathizers or merely outspoken left-wing citizens with no political affiliation with the Soviet Union. Over time, as Bentley’s usefulness as a witness diminished, she exaggerated or fabricated information in an effort to remain relevant, tried her hand in teaching (presumably not teaching students to spy), wrote her autobiography and faded away to such an extent that her death from cancer in 1963 was only briefly mentioned in newspapers. Decades later though her fascinating story was told in Lauren Kessler’s biography on Bentley’s byzantine career, Clever Girl, which was her Soviet code name. 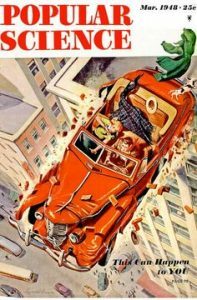 Not many people know spies, but local crime on the other hand is always a troubling issue and to ease citizens concerns Elizabeth, New Jersey police are on the hunt for a woman who took out five books on juvenile delinquency in May 1946 and never returned them! To date she owes $32.36 in fines (at one cent per book, per day), but it would appear that she at least read them thoroughly as she’s put her knowledge gleaned from the books to good use with her daring theft. At the 20th Academy Awards Tweetie Pie wins the Oscar for Best Animated Short, breaking a string of four consecutive Tom & Jerry shorts to claim the award. Released in May 1947 it was the first to feature natural rivals Tweety and Sylvester The Cat, both of whom had appeared separately in previous Warner Brothers cartoons, Tweety as a more aggressive malicious bird which belied his harmless appearance, while Sylvester was a nameless antagonist in various roles, including one with Porky Pig. 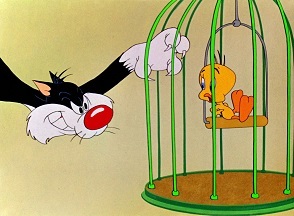 The pairing came about only when Tweety’s creator Bob Clampett left Warner Brothers and Fritz Freeling, who’d created Sylvester, wanted to use the bird as a more interesting foe to the suffering cat over the objections of the producer. Freeling got his way only after threatening to quit and when the resulting cartoon won the Academy Award he was vindicated, leading to Sylvester and Tweety becoming the most familiar character pairing in Looney Toons history. Freeling gave Tweety his yellow feathers and large blue eyes, as well as making him more childlike and innocent to provide a greater contrast with Sylvester, who for this short was called Thomas, but with his personality fully intact, before it was changed to his more familiar Sylvester in 1948. Though probably nobody outside of a few friends and relations were aware of it at the time, Margaret Battavio is born in Lansdale, Pennsylvania. Why is this notable to anyone outside the Battavio family? 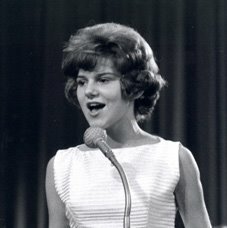 Well, though not the first future rock artist to be born DURING the rock era (Steven Tyler, Gregg Allman, Minnie Riperton among other notable names popped out over the past six months) Battavio would be the first to be born in rock’s lifetime to score a legitimate hit, as Little Peggy March in 1963 with “I Will Follow Him”, a #1 record. Popular Science magazine sells for a quarter. One of the longest running magazines in history it was begun in 1872 as a scientific journal for a well-educated readership. The magazine’s title was transferred to another publication in 1915 amidst declining sales, but the new publishers were able to immediately revive it by making it far more accessible for the average reader. Gone were the scholarly in-depth articles which required advanced scientific knowledge to comprehend and in their place were shorter explanatory pieces that gave the layman a basic understanding of complex scientific topics in a non-academic tone with lots of pictures to illustrate the concepts. The circulation doubled in the first year and remained among the best selling magazines for decades. It reached its peak in the post-war era with a focus on the increasingly mechanical luxuries families were beginning to be able to afford as suburban home ownership soared. For many the magazine was their introduction to learning about all facets of this new frontier, from keeping their new cars maintained to installing backyard barbecues, in addition to encouraging amateur inventors and promoting the math skills needed for mastering the topics they wrote about. March’s issue covered driving hazards with seven keys to safety that are still the standard used today in driving classes yet at the time few had ever seen them laid out clearly and explained so well. Those aggravating motorists who still don’t signal their intentions before turning obviously never had a subscription. The Voice Of Firestone becomes the first radio program to air on both AM and FM stations. The long running show devoted to classical music was a fixture on NBC radio from 1928 through 1956 and in fact was the first commercially sponsored music program to be aired. In 1949 it also became one of the first programs to be simulcast on both radio and television where it remained for a full decade, albeit to generally low ratings. It was brought back for a brief time on TV 1962 before being cancelled for good the following year. The show was considered to be a high-class outlet to combat the low class popular music of jazz and later rock ‘n’ roll, and had its peak audience in the 1930’s but its longevity was the result of the elitist tastes of a few – in this case the family of the Firestone Tire & Rubber Company who sponsored the show throughout its three decade run – trying to dictate what the masses should appreciate. 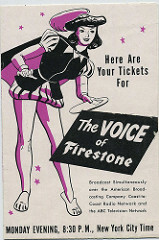 There was a lot of nepotism involved too, as the wife of Firestone’s founder was a composer whose music was often featured on the show over the years, including writing its theme song. FM Radio, despite its sound not carrying nearly as far as AM, had definite advantages over the more popular AM, namely the fact the frequency produced a much better sound, but at the time it was still a niche medium. The classical music of the Firestone program was ideally suited to FM however due to its musical subtleties requiring higher fidelity to be better appreciated. FM’s popularity would remain much more limited until the 1960’s and it finally overtook AM as the dominant form of radio in 1978, ironically relegating AM to the niche programing that had defined FM in its earliest years. Fashions for men: Hats were still a stylistic necessity for going out and no brand was more popular than Stetson. For ten dollars you could choose either the casual and youthful Week-Ender, or the more formal Whippet. Though Stetson insists that being well-dressed is as simple as wearing the right clothes for the right occasion, aside from the colors the differences between the two model hats are imperceptible today. Men’s headwear ran its course by the 1960s until the acceptance of baseball hats in semi-formal settings in 1990’s and beyond. ROY BROWN: Whose Hat Is That?